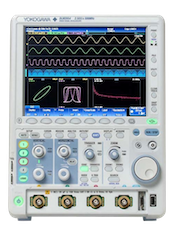 The Yokogawa DLM2000 can make entirely automated measurements of waveform parameters, such as rise time, frequency, or delay. Select from over thirty parameters, and even write custom equations. If your waveform is stable, basic parameter measurements will give you a real time snapshot. Otherwise, the user-friendly continuous parameters function will collect statistical information on any parameter, such as average frequency, over multiple acquisitions.